The Palestinians on Tuesday assumed the 2019 chairmanship of the G77, a group of 134 countries and the biggest of developing countries at the United Nations, despite objections from the US and Israel. The resolution, passed almost unanimously at the UN General Assembly in December, temporarily grants the “State of Palestine” additional rights and significant power to shape the UN’s agenda in the upcoming year. 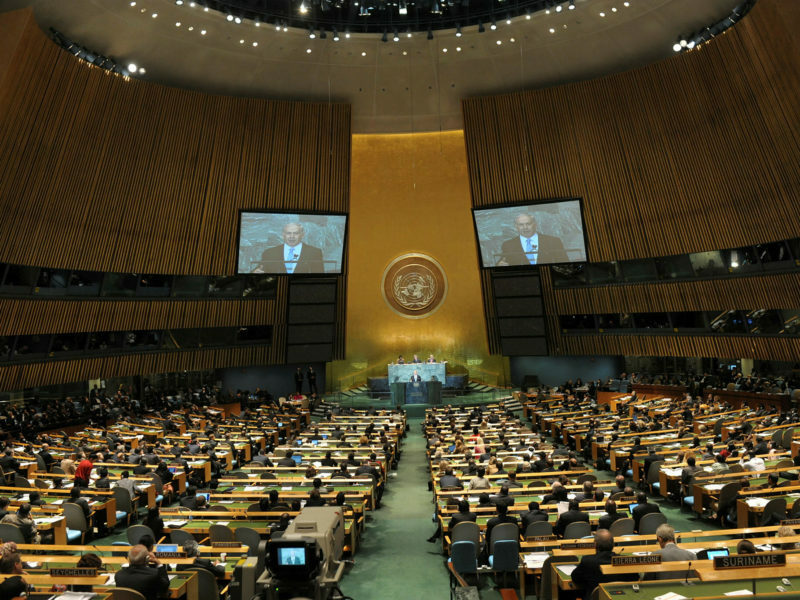 The Group of 77, which includes China, accounts for 80 percent of the world’s population and some two-thirds of all UN member states. The decision to give the Palestinians the lead of the group was made in November by world leaders in a bid to boost the Palestinians’ push for statehood. The US opposed the resolution, saying it enhanced the Palestinians’ diplomatic status outside of direct negotiations with Israel. “With this national accomplishment, Palestine has launched a critical historical phase in which it will exercise its new role within the international system,” he added. While the resolution is technical in nature, experts told TPS that this could constitute a step towards Palestinian statehood. Mohammad Majadli, a reporter for Mossawa news, thinks that the Palestinians’ assumption of the G77 leadership gives credence to their claim for full membership at the UN, and while they currently hold the status of observers, this new role gives them more power to promote procedural motions and co-sponsor proposals and amendments that could enhance their status while acting against Israel. Dr. Hilly Moodrick Even, Senior Lecturer at the Academic College for Law and Science and an expert in international law, explained that this development has limited significance, but significance that should not be ignored. The Palestinian Authority (PA) has been acting in recent years to obtain international recognition for its status as a state at various international venues and bodies, and it’s assuming of the leadership of the G77 was another move in that direction, she said. The move further bolsters the PA’s status at the UN, and the impressive reception it received at the UN is proof of that, Moodrick added. The PA’s successive diplomatic gains are slowly pushing the world towards recognition of its full statehood. This final stage can be obtained only through the UN Security Council, and such a motion is sure to be vetoed by the US, but otherwise, they would have achieved statehood long ago, she believes. The PA’s leadership of the G77 give them more diplomatic, but not legal, clout. However, diplomatic success can lead to legal achievements as well, and therefore this latest development should not be belittled, she cautioned.